The Blast Fan Club is, and has always been, an important part of the Blast's success, on and off the field. Fan Club members are die-hard Blast fans who cheer loudly at Blast games, home and away. The Fan Club takes bus trips to many of the team's away games, and members receive many benefits, including discounts on fan club-sponsored events, five free raffle tickets for an autographed Blast soccer ball, a free raffle ticket for an autographed Blast jersey, one free game ticket and a special gift just for joining. The Fan Club also hosts an annual holiday party (for fan club members only) and an end-of-season Awards Banquet (awards are given out based on fan club voting). The Blast players attend both events. 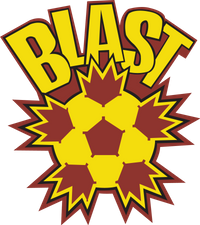 Click here to download an application form for the Baltimore Blast Fan Club. More information is coming. Check The Blast Fan Club Facebook page for more details. Stay tuned for more information about the 2018-19 Baltimore Blast Fan Club Awards Banquet. Not a member? It’s not too late to join! Contact the Fan Club President at blastfanclubpresident@gmail.com. Or stop by the fan club tables at the Arena and sign up! WHY JOIN? BECAUSE IT'S A BLAST! !